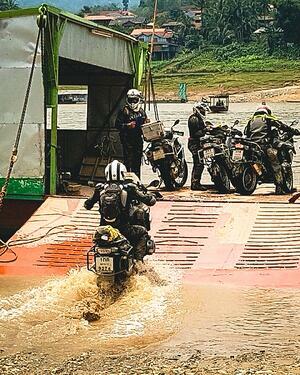 What's it really like, riding the Thai-Laos Experience? With some Asian riding now under my growing belt, I'm glad to confirm that the BIG adventure bikes are excellent for this region, and I would definitely prefer a big bike over a scooter any day for this trip. That we can pick our way through tiny dirt road villages, over dilapidated bridges, and through jungle foliage ... only then to pop-out onto some of the world's most fun paved sweepers and twisties....with twin-cylinder engines letting out some built-up tension and ...... AGGHH! Such a great combination and rush. Wish I had done better capturing the sentiment in the videos thus far though. 1) The Highlight Reel - Like all other routes and tour packages on our website, they all begin with taking the time to ride and explore the region and create the highest percentage of "wow" moments possible for Riders to enjoy. Just like anywhere in the world, not every moment of each riding day will be absolutely amazing; but we've arranged an overall very, very high percentage of moments that will thrill any first-time rider to the region. 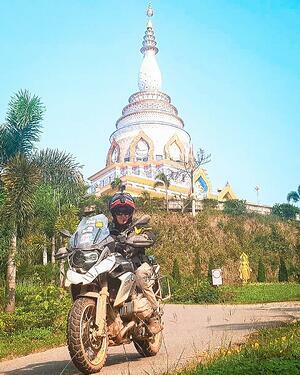 Mostly staying away from the big cities while getting intimate with the mountain roads, tiny dirt villages, and obscure routes, the Guided Group Tour "The Thai-Laos Experience" is exactly that. 2) Trip Format - At this time, we're only able to offer The Thai-Laos Experience as a Guided Group package, instead of like most of our other routes which can also be done as Self-Guided trips. This is mostly due to paperwork/visa/tourism requirements by the Laotian government, but nonetheless, something we must comply with in order to cross the border from Thailand with rented motorcycles. 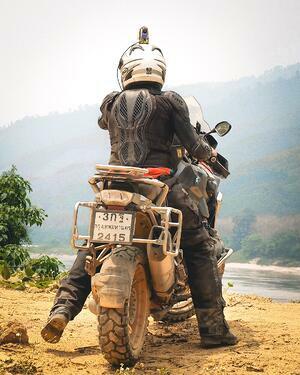 For the scheduled Dates on that tour page, we'll be accepting reservations from like-minded Riders from around the world, and having a blast on this journey through Thailand & Laos. 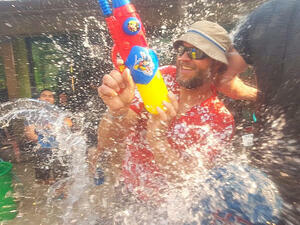 3) Seasonality & Songkran! - Most runnings of this route will be in the driest months, from November through April, but please watch for other possible dates as well. April being the hottest month of the year may sound like a lot to handle (and it definitely is not for everyone) but trips in April come with a bonus feature: Songkran! This 3-day Thai New Year's celebration which has evolved into literally, the world's largest water fight, makes for a truly unique and unforgettable experience. Almost everyone it seems is on vacation then, relaxing, smiling and enjoying, and we get to enjoy along with them by a constant dousing of refreshing splashes to keep each other cool during these hottest days. Not into having fun and mingling with the local people? Definitely look at other dates, but for those of you open to fun new experience ... Thailand's Songkran will be a highlight in life like no other. 4) Terrain: This itinerary is set to show Riders both the smooth paved twisties and long sweepers, as well as the tiny dirt roads that take us way off the beaten path. Most days will involve going back and forth between multiple terrains all day long, just part of what makes this so exciting and challenging. One minute beneath tree canopy in the dirt, and the next you'll be hanging onto the handlebars as the twin-cylinder powerplant pulls you up the mountainside for more fun. Note: While these trips are mostly done in the dry months, a surprise rain could require that we skip some dirt sections, as they will become so muddy that the day's ride would be too long. No worries if this happens though, as the pavement options are fantastic as well. 5) Experienced Riders Only - As mentioned, this route isn't just for everyone. While it's not the most difficult riding many of us have done, we do have it listed as a Level 4 on our Tour Difficulty Grading system as it definitely has its challenges. Nothing we put into words or videos can ever quite recreate the demands you'll encounter as a Rider, but part of our service is to consult with you about whether your riding background and skills should be enough to finish the route safely and with a smile. We want nothing more than for Riders to have incredible and complete experiences on these trips, so please keep that in mind! 6) Want to Reserve Your Spot? - Check out the The Thai-Laos Experience tour page, and you'll see a Contact Form right there to get your consultation and booking process started with us. Keep in mind that we want to ask you some questions as well, and help make sure that this trip is right for you. 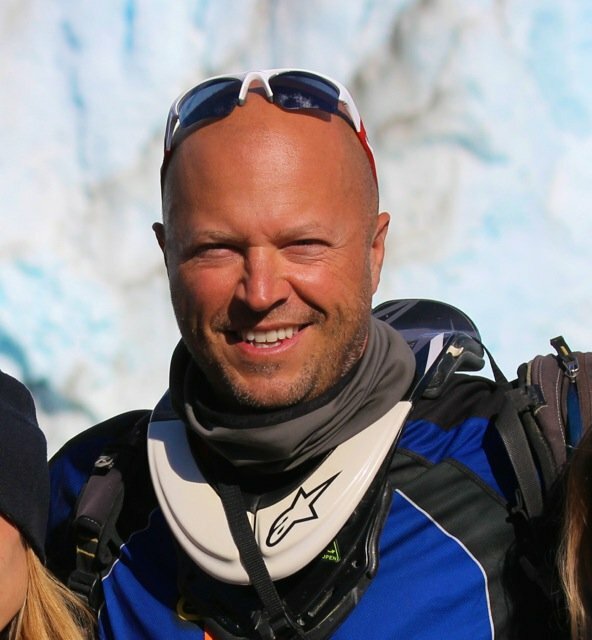 We have no doubt that it's a trip anyone could enjoy, but again, part of our service is making sure you're choosing the right riding adventure for your next big international journey!